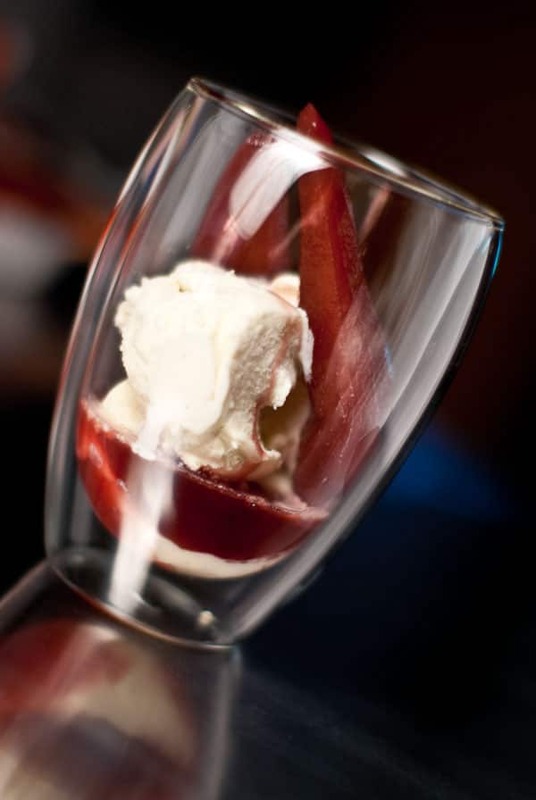 Pomegranate poached pears with vanilla ice cream. I’m back from my whirlwind trip to Japan and Korea and am bursting at the seams (it could also have something to do with the 5+ daily meals I consumed) to try out over a dozen dishes I came up with while away from the kitchen and this blog. I set out to be inspired by new flavors and ingredients, but the greatest inspirations came during all the quiet moments in between a week and a half of prolific eating. Whether I was on a plane seven miles above the rest of the world or on a crowded yet eerily quiet Tokyo subway, these little out-of-context pauses gave me time to reflect, not only on all the new foods I tried, but on all the ingredients waiting for me back at home. This dish was born during one of those contemplative moments. Its complex harmony of aromas, textures and tastes belies the utter simplicity of its preparation. Served warm over a pile of vanilla ice cream it makes for a compelling dessert, while serving it with strained yogurt and a little granola makes for a fast healthy breakfast. Put the pears, juice and sugar in a pot making sure the pears are completely covered (add more juice and sugar if need be). Bring the mixture to a boil and turn down the heat to maintain a gentle simmer. Cover with a lid set ajar and cook for 20 minutes or until the pears are a deep crimson and they are firm but no longer crunchy. Serve with a scoop of vanilla ice cream, yogurt, or by themselves, doused in the poaching liquid. looks so delicious! I will try this for my dinner party this weekend, considering i have 8 bottles of POM in my fridge! Welcome back Marc…this looks very easy and I love the deep red colours. Love this! Such a simple but elegant dessert! This looks and sound delicious. Beautiful crimson color! Marc, welcome back and hope you had a fab time. 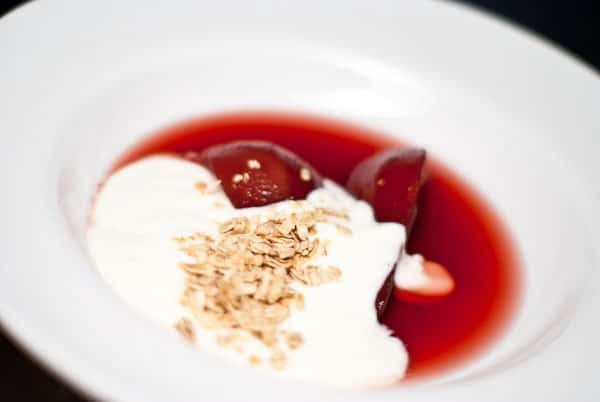 Pomegranates are par for the season and looks good on poached pears. Gorgeous Marc. Happy New Year! I hope you had a great trip. Pomegranate! I love stuff that is antioxidant-y (cranberries, blueberries, green tea, etc) so I’ve been a fan of Poms since I was in middle school! I’m glad they are more readily available everywhere now. What a sophisticated yet simple way to showcase the harmonies of these flavors. Nice! Simple, yet I bet it packed a big, big taste. Very nice, it looks like a good alternative to wine poaching. How neat!! I have some POM to use up, and I just fell in love with fresh poached pears the other day! This is what I’m going to make for dessert! Thank you! Wait, did you say POMEGRANATE?? Maybe my pears were on the large side — anyway, I ended up poaching them in 16 oz of pom juice, round side down but in a stainless saute pan rather than a pot. After their 20 minute sauna, I turned them cut side down and they turned out just great!! !